The article below details the latest VA assault on veterans of the 1991 Gulf War, where a letter from House Veterans' Affairs Committee senior members to VA leaders requesting new presumptives for claims by Gulf War veterans was flatly denied. Sadly, this is yet one more example of it goes when VA is "asked nicely". The scientific research evidence for brain cancer in Khamisiyah is compelling, as is noted in this article, yet VA still twists an IOM report to their own advantage (VA wrote the contract for that IOM report, by the way) and now VA denies this new presumptive. And sadly, the research evidence for the other conditions is not yet compelling on its fact, as the article also notes -- and this fact is another angering example of why VA's research leadership must be held accountable to perform the right research and to report properly on medical research related to Gulf War veterans. These serious issues of another area where VA is badly broken are not new, they've been the subject of repeated RAC reports and public meetings and Congressional hearings and testimony over many years. It's now clear that legislation must be introduced and enacted for a Khamisiyah brain cancer presumptive, and it must be made retroactive to ensure benefits for the surviving spouses including where the veteran may not have had a claim on file that could be approved. To allay Congressional budget hawks' concerns, the bill's cost should be relatively small given the relatively small number of these brain cancer deaths. However, for the surviving spouses of those affected, the impact would be profound, and provide a small measure of justice for them. Additionally, all of this is just one more fuel for why H.R. 4261, the Gulf War Health Research Reform Act of 2014, must be enacted to ensure the kinds of independent research review that is necessary. However, currently VA staff are winning over Gulf War veterans in the Senate, where the bill is languishing without action and will not be taken up in the current conference committee, contrary to previous assertions that Gulf War veterans' advocates took to be true on their face. WASHINGTON — The Department of Veterans Affairs has rejected a request from members of Congress and veterans advocates to make brain cancer, lung cancer and migraines presumptive conditions for Gulf War veterans. Officials said they cannot prove the high rate of these illnesses among Gulf War vets are related to military service. VA officials said the number of brain cancer deaths for soldiers exposed to sarin gas was too low to be conclusive, though it was double the rate of soldiers not exposed. And the rate of lung cancer deaths, though 15% higher than those who did not serve in the 1991 Gulf War, is "inconclusive" because researchers did not know how many of the servicemembers smoke. "I'm disappointed with their decision, but hold out hope that further studies will convince the VA," Rep. Timothy Walz, D-Minn., told USA TODAY. "We must ensure our brave veterans get the care they need, and this is part of that effort." If a veteran is diagnosed with a presumptive condition, Veterans Affairs is required to assume that it is military-connected, and that the veteran is then entitled to medical or disability benefits associated with the diagnosis. Those exposed to smoke after Saddam Hussein set his oil wells on fire, as well as to sarin gas after the U.S. bombed a munitions plant in Khamisayah, Iraq, saw an increased risk of brain cancer, according to a study Rep. Mike Coffman, R-Colo., and Walz cited in letters to former VA Secretary Eric Shinseki in March. As many as 100,000 troops may have been exposed to sarin, a nerve agent, according to the Defense Department, but a recent study shows more may have been affected. 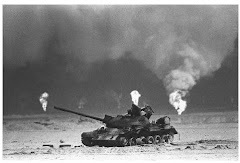 Gulf War vets also saw a "significant relative excess" of lung cancer, according to a second study. And a third study showed that veterans with chronic fatigue syndrome or Gulf War Illness were likely to also suffer migraines, the lawmakers wrote. "I am very interested in your opinion of whether the studies enclosed are sufficient to add these three health problems to the list of presumptives related to Gulf War Illness," Coffman wrote in March. "If you believe they are not, please detail the VA's current and planned efforts related to these three problems." Robert Jesse, VA's acting undersecretary for health, turned down the request, saying that the Institute of Medicine found "inadequate and insufficient evidence" for an association between Gulf War service and the diseases. "IOM stated that there 'is no consistent evidence of a higher overall incidence of cancer in veterans who were deployed to the Gulf War than in non-deployed veterans,'" Jesse wrote in a letter to Walz. Ron Brown, president of the National Gulf War Resource Center, said the official response flies in the face of VA's own research. "What they've done is used the overall population of deployed veterans during Desert Storm," he said. "If you use the whole population, it does not show an increase of cancers, but if you look at Khamisiyah, there are significant increases of cancers." A 2007 Institute of Medicine study found that, though the number of cases was small, the brain cancer death rate for servicemembers in the sarin-gas exposure zone was twice as high as for servicemembers outside it, according to the American Journal of Public Health. For unexposed soldiers, the brain cancer death rate from 1991 to 2000 was 12 per 100,000. For those near Khamisiyah, the rate was 25 per 100,000. Jesse said, in his letter, that there had been "little previous evidence" of a connection between sarin and brain cancer. 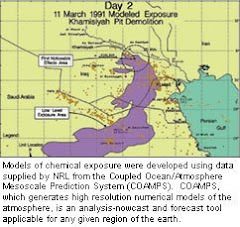 According to a VA website about the study, "Controlling for oil well fire smoke exposure, Army Gulf War veterans who were potentially exposed to nerve agents at Khamisiyah had a higher mortality rate from brain cancer compared to Army veterans who were not considered exposed." Victoria Davey, VA's chief officer of public health, wrote in a letter to Brown that there was a 15% "excess risk of lung cancer" associated with Gulf War deployment, but said that study was inconclusive because the researchers didn't know whether the servicemembers were smokers. She wrote that there was a concern because about 5% more Gulf War veterans smoked than did veterans who did not deploy. According to the American Cancer Society, the average age of someone who smokes who is diagnosed with lung cancer is 70. Fewer than 2% of all cases are found in people younger than 45. According to VA, the average age of a Gulf War veteran is 44. Gulf War veterans already have presumptive status for chronic fatigue syndrome, fibromyalgia, gastrointestinal disorders, and undiagnosed illnesses that include weight loss, fatigue, cardiovascular disease, muscle and joint pain, headache, menstrual disorders, neurological and psychological problems, skin conditions, respiratory disorders and sleep disturbances, according to VA.
Data recently released by the VA show that 80% of disability claims filed by Gulf War veterans for conditions related to the war were denied. "This is nothing new," Brown said. "Our veterans have been fighting for 23 years to get the benefits they've earned." MANATEE, FLA. -- U.S. forces suffered fewer than 200 battle deaths during the 1990-91 Gulf War as they drove Saddam Hussein's Iraqi military out of Kuwait. It was a textbook example of military precision and power that gave little hint of the looming health disaster that would befall many Gulf War veterans. By some estimates, one in three veterans of that war would eventually struggle with Gulf War Illness. "Gulf War Illness is a serious physical disease, affecting at least 175,000 veterans of the 1990-1991 Gulf War, that resulted from hazardous exposures in the Gulf War theater," according to a research advisory committee report released in April. Gulf War vets were frustrated by years of governmental inaction on their problems, just as Vietnam veterans were two decades earlier with Agent Orange. But now, some of the most significant research on Gulf War Illness is being conducted at Roskamp Institute in Manatee County. The research is funded under the Gulf War Illness Congressionally Directed Medical Research Program [CDMRP]. 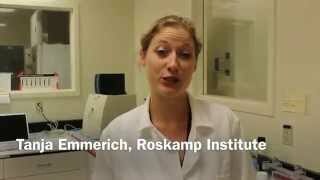 Roskamp Institute is best known for its ground-breaking research on Alzheimer's Disease. The disease can now be cured in mice. Roskamp is conducting Phase III clinical trials on an Alzheimer's drug for humans in Europe. It's a big step from mice to humans in developing treatments, said Fiona Crawford, president of Roskamp Institute. Similarly, Roskamp has developed mouse models of Gulf War Illness, she said. "We try to mimic the disease in people with mice," Crawford said. Roskamp researcher have exposed mice to some of the same agents that soldiers were exposed to in the Gulf War. Initially, the mice may appear OK, then as they age they begin to show the same symptoms experienced by Gulf War vets. The best way to develop a model for the disease is by working with mice, said Tanja Emmerich, a doctoral student researching Gulf War Illness at Roskamp Institute. "We have a mouse model where we look at the blood and see certain changes. Then we look at human blood and see certain changes. We can determine how well the model works," Emmerich said. Treatments that work on mice offer clues about what might help people as well. "We're trying to make the bridge here," she said. Treating Gulf War Illness is difficult because symptoms differ greatly from one person to another. "Symptoms typically include some combination of widespread pain, headache, persistent problems with memory and thinking, fatigue, breathing problems, stomach and intestinal symptoms, and skin abnormalities," according to a Research Advisory Committee on Gulf War Veterans' Illnesses. The research at Roskamp is being used to develop a panel of bio markers for Gulf War Illness, Emmerich said. Roskamp researchers said they expect to start recruiting soon from the local veterans population for clinical trials of an FDA-approved drug to treat Gulf War Illness. In the coming months, Roskamp is planning an open house for veterans, healthy or not, who would like to hear about work the institute is doing and who would like to possibly participate in screening. "It's heart-breaking to have folks come up and say no one is listening to them. We tell them they are not alone," Crawford said. One of the greatest rewards Emmerich said she receives from her research is having vets tell her that they are happy someone is listening to them and taking their concerns seriously. Anthony Hardie, a Bradenton resident who is a nationally recognized advocate for vets with Gulf War Illness, has testified before Congress, and has also shared his experiences with Roskamp. He is such a passionate and knowledgeable speaker that researchers listen raptly when Hardie talks. Hardie believes he came in contact with toxic agents when going through an Iraqi bunker, based on the odor of geraniums and white onions that he smelled. Lewisite, which has the smell of geraniums, is a blister agent or lung irritant. Mustard gas may smell like garlic, mustard or onions. "It had all the classic signs of a chemical warfare agent," Hardie said. As many as 250,000 of the 697,000 U.S. troops who served in the Gulf War may be dealing with Gulf War Illness, Hardie said. Hardie suffers from chronic, widespread pain, sleep disturbances, frequent infections, and fatigue. When the Persian Gulf War Veterans Act of 1998 was enacted, Hardie hoped his work was done. "It was our first experience with VA bureaucrats fighting laws they don't like," he said. "We still have a significant amount of denial from high-level bureaucrats." Too often VA has been more concerned about its budget than the needs of veterans, Hardie said. "We need to have actual treatment research. We need to have our Gulf War veterans adequately compensated for their illness. VA has an 80 percent denial rate for Gulf War claims." With the recent VA scandal growing out of Phoenix and spreading nationwide, the public has finally become aware of VA issues, he said. Hardie applauds the research being done at Roskamp but says the federal government needs to be spending much more on research. "We're spending a drop in the bucket for an illness that affects one in three Gulf War veterans. That makes me angry. We have a long, long way to go, and the VA is still failing veterans." For more information about Roskamp veterans screening, call 941-752-2949, ext. 395. For more information about Roskamp Institute, visit rfdn.org. James A. Jones Jr., Herald reporter, can be contacted at (941) 745-7053 or on Twitter @jajones1. Jones is a U.S. veteran of the Vietnam War. Gulf War veterans critical of the Department of Veterans Affairs' record on addressing their health problems are hoping the VA's new health administrator is a sign things will change. Dr. Robert Jesse, named Acting Under Secretary of Health after Dr. Robert Petzel resigned amid thescandal involving manipulated patient appointmentsthat contributed to veteran deaths, was replaced on Wednesday by Dr. Carolyn Clancy, previously assistant deputy undersecretary for health for quality, safety and value. Jesse had a history with Gulf War vets as the VA's point man on Gulf War Illness (GWI) research. It was a role that won him no praise from the Research Advisory Committee on Gulf War Veterans' Illnesses, a veteran-heavy group whose work Jesse sought to undermine, according to its chairman. "The one personnel action that he did take [with the committee] was to propose full committee membership to two scientists whose view is that Gulf War Illness is connected to stress," RAC Chairman James Binns told Military.com. "Jesse is a very personable individual and we initially hoped his appointment would mean the VA's policy would change, but in fact he was just as much as advocate for the old policy." Data recently released by the VA shows that 80 percent of disability claims filed by Gulf War veterans for conditions related to the war were denied. Last March, a former VA epidemiologist testified that the department's Office of Public Health buries or obscures research findings on veterans exposed to environmental toxins and hazards going as far back as the Gulf War. "Anything that supports the position that Gulf War illness is a neurological condition is unlikely to ever be published," Steve Coughlin told the House Veterans Affairs Committee. Binns said he has no dealings with Clancy and does not know what to expect. He is hoping she will be more aggressive and transparent in resolving GWI issues. "Unfortunately, the pattern in the past is that a person connected with minimizing Gulf War Illness has been replaced by people who follow the same [thinking]," Binns said. Rep. Mike Coffman, R-Colo., a Gulf War veteran and one of the strongest voices on Capitol Hill for that constituency, said he has been "extremely disappointed" at the actions and conduct of the VA, including Jesse, in addressing GWI and working with the Research Advisory Committee. "Care for Gulf War veterans has stagnated and quite simply, VA is not conducting the necessary research," Coffman said on Friday. Coffman serves on the House Veterans Affairs Committee and chairs its subcommittee on oversight and investigations. During a June 13 hearing Coffman demanded to know from Jesse if the VA was hiding data on Gulf War Illness, just as it has been found to be hiding information about manipulated patient wait times at VA hospitals across the country. Jesse insisted that the VA is not hiding data. "I have been told Dr. Jesse will be remaining in VA in a medical capacity as a physician and clinician," Coffman told Military.com. "I sincerely hope his medical skills will more positively impact veterans than his conduct toward the Research Advisory Committee for Gulf War Illnesses." With Jesse going the way of Petzel, who was also viewed by Gulf War veterans as an obstacle to fully and honestly researching Gulf War Illness, Binns said this "is the opportunity for the VA to cleanse itself of these [past] practices that have created such a toxic culture." "Now's the time to get [all the facts] out in the open," he said. "Start fresh rather than continue to hide some of these completely dishonest practices, which forces otherwise decent people to lie in the course of their job."